Definition at line 31 of file itkQuadEdgeMeshQuadricDecimation.h. Reimplemented from itk::QuadEdgeMeshEdgeMergeDecimationFilter< TInput, TOutput, TCriterion >. Definition at line 37 of file itkQuadEdgeMeshQuadricDecimation.h. Reimplemented from itk::QuadEdgeMeshDecimationFilter< TInput, TOutput, TCriterion >. Definition at line 70 of file itkQuadEdgeMeshEdgeMergeDecimationFilter.h. Definition at line 64 of file itkQuadEdgeMeshQuadricDecimation.h. Definition at line 56 of file itkMeshSource.h. Definition at line 58 of file itkQuadEdgeMeshToQuadEdgeMeshFilter.h. Reimplemented in itk::QuadEdgeMeshCleanFilter< TInput, TOutput >. Definition at line 63 of file itkQuadEdgeMeshToQuadEdgeMeshFilter.h. Definition at line 49 of file itkQuadEdgeMeshToQuadEdgeMeshFilter.h. Definition at line 60 of file itkQuadEdgeMeshToQuadEdgeMeshFilter.h. Definition at line 48 of file itkQuadEdgeMeshToQuadEdgeMeshFilter.h. Definition at line 48 of file itkQuadEdgeMeshQuadricDecimation.h. Definition at line 45 of file itkQuadEdgeMeshQuadricDecimation.h. Definition at line 51 of file itkQuadEdgeMeshToQuadEdgeMeshFilter.h. Definition at line 62 of file itkQuadEdgeMeshToQuadEdgeMeshFilter.h. Definition at line 56 of file itkQuadEdgeMeshToQuadEdgeMeshFilter.h. Definition at line 65 of file itkQuadEdgeMeshToQuadEdgeMeshFilter.h. Definition at line 50 of file itkQuadEdgeMeshToQuadEdgeMeshFilter.h. Definition at line 61 of file itkQuadEdgeMeshToQuadEdgeMeshFilter.h. Definition at line 67 of file itkQuadEdgeMeshToQuadEdgeMeshFilter.h. Definition at line 52 of file itkQuadEdgeMeshToQuadEdgeMeshFilter.h. Definition at line 53 of file itkQuadEdgeMeshToQuadEdgeMeshFilter.h. Definition at line 65 of file itkQuadEdgeMeshQuadricDecimation.h. Definition at line 76 of file itkQuadEdgeMeshQuadricDecimation.h. Definition at line 75 of file itkQuadEdgeMeshQuadricDecimation.h. Definition at line 63 of file itkQuadEdgeMeshEdgeMergeDecimationFilter.h. Definition at line 57 of file itkQuadEdgeMeshQuadricDecimation.h. Definition at line 64 of file itkQuadEdgeMeshEdgeMergeDecimationFilter.h. Definition at line 62 of file itkQuadEdgeMeshEdgeMergeDecimationFilter.h. Definition at line 73 of file itkQuadEdgeMeshToQuadEdgeMeshFilter.h. Definition at line 54 of file itkQuadEdgeMeshQuadricDecimation.h. Definition at line 56 of file itkQuadEdgeMeshQuadricDecimation.h. Definition at line 72 of file itkQuadEdgeMeshToQuadEdgeMeshFilter.h. Definition at line 51 of file itkQuadEdgeMeshQuadricDecimation.h. Definition at line 50 of file itkQuadEdgeMeshQuadricDecimation.h. Definition at line 52 of file itkQuadEdgeMeshQuadricDecimation.h. Reimplemented from itk::QuadEdgeMeshToQuadEdgeMeshFilter< TInput, TOutput >. Definition at line 59 of file itkQuadEdgeMeshQuadricDecimation.h. Definition at line 58 of file itkQuadEdgeMeshQuadricDecimation.h. Definition at line 53 of file itkQuadEdgeMeshQuadricDecimation.h. Definition at line 67 of file itkQuadEdgeMeshEdgeMergeDecimationFilter.h. Definition at line 78 of file itkQuadEdgeMeshToQuadEdgeMeshFilter.h. Definition at line 76 of file itkQuadEdgeMeshToQuadEdgeMeshFilter.h. Definition at line 55 of file itkQuadEdgeMeshQuadricDecimation.h. Definition at line 59 of file itkQuadEdgeMeshEdgeMergeDecimationFilter.h. Definition at line 36 of file itkQuadEdgeMeshQuadricDecimation.h. Definition at line 68 of file itkQuadEdgeMeshQuadricDecimation.h. Definition at line 70 of file itkQuadEdgeMeshQuadricDecimation.h. Definition at line 69 of file itkQuadEdgeMeshQuadricDecimation.h. Definition at line 67 of file itkQuadEdgeMeshQuadricDecimation.h. Definition at line 84 of file itkQuadEdgeMeshQuadricDecimation.h. Definition at line 82 of file itkQuadEdgeMeshQuadricDecimation.h. Definition at line 79 of file itkQuadEdgeMeshQuadricDecimation.h. Definition at line 73 of file itkQuadEdgeMeshQuadricDecimation.h. Definition at line 72 of file itkQuadEdgeMeshQuadricDecimation.h. Definition at line 35 of file itkQuadEdgeMeshQuadricDecimation.h. Definition at line 39 of file itkQuadEdgeMeshQuadricDecimation.h. Definition at line 88 of file itkQuadEdgeMeshQuadricDecimation.h. Definition at line 89 of file itkQuadEdgeMeshQuadricDecimation.h. Finish to implement this method! Definition at line 202 of file itkQuadEdgeMeshEdgeMergeDecimationFilter.h. References itk::QuadEdgeMeshPolygonCell< TCellInterface >::GetEdgeRingEntry(), and itk::MeshSource< TOutput >::GetOutput(). Delete a given edge in the priority queue. Definition at line 153 of file itkQuadEdgeMeshQuadricDecimation.h. References itk::QuadEdgeMeshEdgeMergeDecimationFilter< TInput, TOutput, TCriterion >::DeletePoint(), and itk::QuadEdgeMeshQuadricDecimation< TInput, TOutput, TCriterion >::m_Quadric. Extract the edge to be processed. Implements itk::QuadEdgeMeshDecimationFilter< TInput, TOutput, TCriterion >. Definition at line 67 of file itkQuadEdgeMeshDecimationFilter.h. 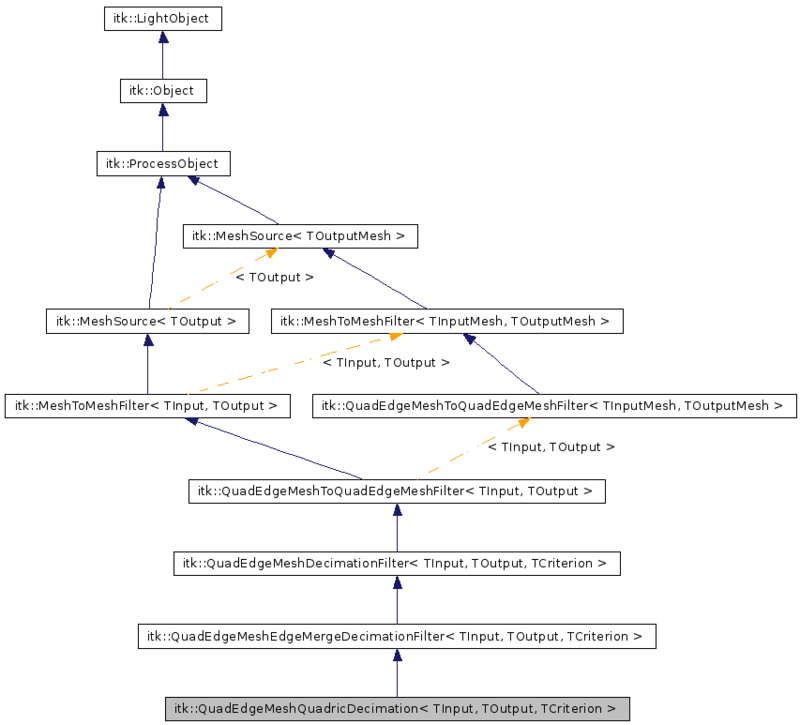 References itk::QuadEdgeMeshDecimationFilter< TInput, TOutput, TCriterion >::Extract(), itk::QuadEdgeMeshDecimationFilter< TInput, TOutput, TCriterion >::FillPriorityQueue(), HardConnectedComponentImageFilter::GenerateData(), itk::MeshSource< TOutput >::GetOutput(), itk::QuadEdgeMeshDecimationFilter< TInput, TOutput, TCriterion >::Initialize(), itk::QuadEdgeMeshDecimationFilter< TInput, TOutput, TCriterion >::IsCriterionSatisfied(), itk::QuadEdgeMeshDecimationFilter< TInput, TOutput, TCriterion >::m_Criterion, itk::QuadEdgeMeshDecimationFilter< TInput, TOutput, TCriterion >::m_Iteration, itk::QuadEdgeMeshDecimationFilter< TInput, TOutput, TCriterion >::ProcessWithoutAnyTopologicalGuarantee(), and itk::QuadEdgeMeshDecimationFilter< TInput, TOutput, TCriterion >::ProcessWithTopologicalGuarantee(). Requested region of Mesh is specified as i of N unstructured regions. Since all DataObjects should be able to set the requested region in unstructured form, just copy output->RequestedRegion all inputs. Get the mesh input of this process object. Get the mesh output of this process object. Referenced by itk::QuadEdgeMeshEdgeMergeDecimationFilter< TInput, TOutput, TCriterion >::CheckOrientation(), itk::QuadEdgeMeshCleanFilter< TInput, TOutput >::CleanPoints(), itk::QuadEdgeMeshDecimationFilter< TInput, TOutput, TCriterion >::GenerateData(), itk::QuadEdgeMeshQuadricDecimation< TInput, TOutput, TCriterion >::Initialize(), itk::QuadEdgeMeshSquaredEdgeLengthDecimation< TInput, TOutput, TCriterion >::MeasureEdge(), itk::QuadEdgeMeshCleanFilter< TInput, TOutput >::MergePoints(), and itk::QuadEdgeMeshQuadricDecimation< TInput, TOutput, TCriterion >::QuadricAtOrigin(). Definition at line 93 of file itkQuadEdgeMeshQuadricDecimation.h. 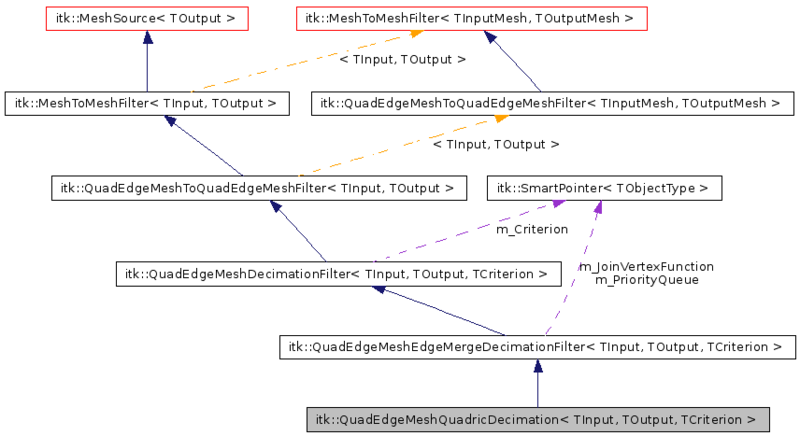 References itk::MeshSource< TOutput >::GetOutput(), itk::QuadEdgeMeshQuadricDecimation< TInput, TOutput, TCriterion >::m_Quadric, and itk::QuadEdgeMeshQuadricDecimation< TInput, TOutput, TCriterion >::QuadricAtOrigin(). Check if iEdge is valid and then can be processed. Make a DataObject of the correct type to used as the specified output. Every ProcessObject subclass must be able to create a DataObject that can be used as a specified output. This method is automatically called when DataObject::DisconnectPipeline() is called. DataObject::DisconnectPipeline, disconnects a data object from being an output of its current source. When the data object is disconnected, the ProcessObject needs to construct a replacement output data object so that the ProcessObject is in a valid state. So DataObject::DisconnectPipeline eventually calls ProcessObject::MakeOutput. Note that MakeOutput always returns a SmartPointer to a DataObject. If a subclass of MeshSource has multiple outputs of different types, then that class must provide an implementation of MakeOutput(). Compute the measure value for iEdge. Implements itk::QuadEdgeMeshEdgeMergeDecimationFilter< TInput, TOutput, TCriterion >. Definition at line 144 of file itkQuadEdgeMeshQuadricDecimation.h. References itk::QuadEdgeMeshDecimationQuadricElementHelper< TPoint >::ComputeErrorAtOptimalLocation(), and itk::QuadEdgeMeshQuadricDecimation< TInput, TOutput, TCriterion >::m_Quadric. Reimplemented from itk::MeshSource< TOutput >. Definition at line 103 of file itkQuadEdgeMeshDecimationFilter.h. Push one edge in the priority queue. Push iEdge in the priority queue if it is not already, else its corresponding priority value is updated. Definition at line 120 of file itkQuadEdgeMeshQuadricDecimation.h. References itk::QuadEdgeMeshDecimationQuadricElementHelper< TPoint >::AddTriangle(), and itk::MeshSource< TOutput >::GetOutput(). Referenced by itk::QuadEdgeMeshQuadricDecimation< TInput, TOutput, TCriterion >::Initialize(). Definition at line 165 of file itkQuadEdgeMeshQuadricDecimation.h. References itk::QuadEdgeMeshDecimationQuadricElementHelper< TPoint >::ComputeOptimalLocation(), and itk::QuadEdgeMeshQuadricDecimation< TInput, TOutput, TCriterion >::m_Quadric. Set the mesh input of this process object. Set the mesh output of this process object. This call is slated to be removed from ITK. You should GraftOutput() and possible DataObject::DisconnectPipeline() to properly change the output. Definition at line 94 of file itkQuadEdgeMeshEdgeMergeDecimationFilter.h. Definition at line 64 of file itkQuadEdgeMeshDecimationFilter.h. Referenced by itk::QuadEdgeMeshDecimationFilter< TInput, TOutput, TCriterion >::GenerateData(). Definition at line 98 of file itkQuadEdgeMeshEdgeMergeDecimationFilter.h. Definition at line 65 of file itkQuadEdgeMeshDecimationFilter.h. Referenced by itk::QuadEdgeMeshDecimationFilter< TInput, TOutput, TCriterion >::GenerateData(), and itk::QuadEdgeMeshDecimationFilter< TInput, TOutput, TCriterion >::QuadEdgeMeshDecimationFilter(). Definition at line 100 of file itkQuadEdgeMeshEdgeMergeDecimationFilter.h. Definition at line 99 of file itkQuadEdgeMeshEdgeMergeDecimationFilter.h. Definition at line 96 of file itkQuadEdgeMeshEdgeMergeDecimationFilter.h. Definition at line 91 of file itkQuadEdgeMeshQuadricDecimation.h. Referenced by itk::QuadEdgeMeshQuadricDecimation< TInput, TOutput, TCriterion >::DeletePoint(), itk::QuadEdgeMeshQuadricDecimation< TInput, TOutput, TCriterion >::Initialize(), itk::QuadEdgeMeshQuadricDecimation< TInput, TOutput, TCriterion >::MeasureEdge(), and itk::QuadEdgeMeshQuadricDecimation< TInput, TOutput, TCriterion >::Relocate(). Definition at line 97 of file itkQuadEdgeMeshEdgeMergeDecimationFilter.h. Definition at line 93 of file itkQuadEdgeMeshEdgeMergeDecimationFilter.h. Definition at line 92 of file itkQuadEdgeMeshEdgeMergeDecimationFilter.h.